I love playing with robots and this little platform looks to be a great entry-level kit for you and your kids. It sounds like it might even be a bit hackable, once to you assemble it and get it working. I could see putting in some circuits I have found in other books and web sites, like photovore/photophobe behaviors and more. With a big enough solar panel you could probably also use the sun to power it. These $77 PicoBotz kits are the perfect thing to let the budding engineer (your kids) get their hands on some robotics. 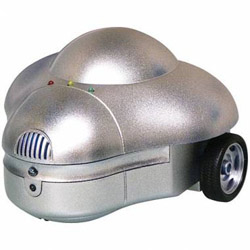 The "robot" has 180 programmable commands and operates in three modes, obstacle avoidance, sound repositioning mode, and line tracing mode.